Illuminate your complexion with Revlon's Highlighting Palette in 'Bronze Glow'. Combining five complementary shades, each silky, shimmering powder blends seamlessly onto skin to deliver sun-kissed colour with an expertly sculpted, multi-dimensional finish. Housed in a sleek compact for touch-ups on-the-go. 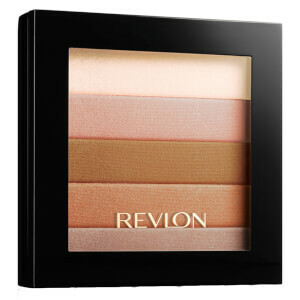 Simply sweep over the cheek and brow bones to enhance natural radiance and accentuate your favourite facial features.